This double CD of piano music is for people who like a touch of bleakness to their listening. Galina Ustvolskaya was a shy and introspective composer known, according to the sleeve notes, as “the lady with the hammer” because of her unrelenting rhythms. The sleeve notes talk about her distinctive notation, which as far as most listeners will notice, talks about the dynamics and in particular her ffff and pppp contrasts. Her music is reportedly hard to play, presumably not because of the actual music but because it’s hard to get the overall sound right, and play it as it’s meant to be. 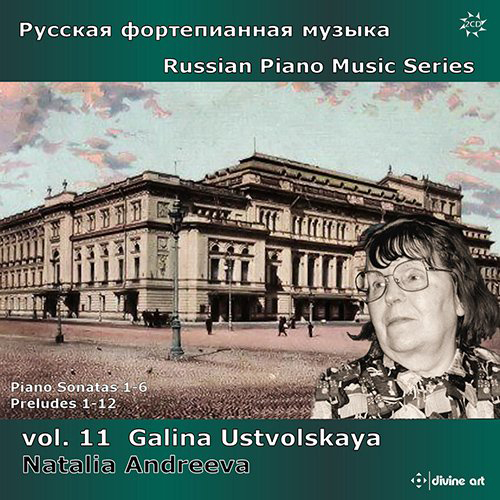 Russian pianist Natalia Andreeva, who now lectures in Australia, has studied Ustvolskaya in depth and captures the sound the composer wanted. The biggest clue to the music is that it’s “not just” about the bleakness of communism and a voice “from the Black Hole of Leningrad”, clearly an indication that there’s a lot of that about it. Andreeva herself says she focussed on three areas to draw out the flavour of the music: Russian folklore, religion (specifically the sound of church bells)… and human suffering from the Black Hole of Leningrad. We were surprised to read the “The lady with the hammer” soubriquet because while the rhythm can be unvarying, it’s not forceful music, rather it’s bleak and abstract; it’s hopeful in the sense of “I hope I won’t die” rather than “I hope the sun shines”. It’s got a bleak edge to it that suggests uncertainty, as one might expect of communism. This double CD opens with 12 preludes, which are gentler than other sections of the CD. Ustvolskaya tried to write them as if she was not influenced by any other composer. Then come the early and late sonatas, in order, the earlies taking the listener from CD1 to CD2, and the later ones being where the church bells come in, as Andreeva tries to evoke the composer’s instruction to play with feeling (she also directs some playing with the knuckles).